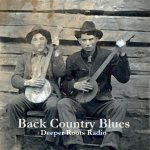 Our show features the sounds of the acoustic country blues. We’ll hear from early century greats like Jim Jackson, Luke Jordan, Geeshie Wiley, and Gus Cannon’s Jug Stompers. There will also be a little help from some contemporaries who were their influence by this music. Get ready for some deeper sounds from Daddy Stovepipe, Papa Charlie Jackson, and Frank Stokes to round things out on a chilly evening in the North Bay on Sonoma County community radio. We’ll revisit the third decade of the 20th century where the social and cultural watershed events following the first World War were more than one could have anticipated. The Jazz Age; Prohibition; Radio and the Victrola meant entertainment could be had in the front room, replacing the family and neighborhood parlor entertainment. While the Great Depression loomed on the horizon, the music that found the middle was hopeful and full of man-meets-girl songs were all the rage…even if signs of hard times to come were easily spotted. 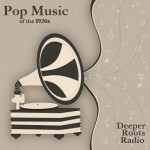 Listen in for a chronological selection that includes the sounds of Duke Ellington, Paul Whiteman, Annette Hanshaw, Ethel Waters, and the peerless pop icons Al Jolson and Eddie Cantor. Once considered in its earliest forms a noble instrument, the history of the guitar can be traced back over forty centuries (yes, that’s 4000 years). While we won’t got back quite so far in our exploration, we will explore the popular form of this instrument in song this week. We’re not going after the genius as much as we go after the topic with songs whose theme is that of the guitar. It seems that there has always been a personal connection between the instrument and the player, sometimes as a confidant and others as a foil. Our show will feature yodeling guitars, lonely guitars, Bo’s guitar, long-legged pickers, amigos, and a number of performances about ‘one’s first guitar’. 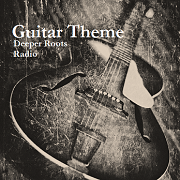 Join Dave Stroud for plenty in a guitar themed journey. I just finished an excellent book by an excellent writer. I’d like to say this happens more than twice a year but I’m very picky about my writers and more picky about how they can turn a phrase. The book I read was “Devil Sent The Rain” by Tom Piazza, a frequent contributor to the cherished Oxford American magazine. The title is based on the poorly recorded, almost unintelligible, song performed by Charley Patton. The book is a collection of essays, liner notes, and articles that Piazza has assembled to tell stories of American culture that are both personal and powerful. He takes us from Hurricane Katrina to Jimmy Martin, then from Charley Patton to Charlie Chan, then into the worlds of Norman Mailer and Bob Dylan; and oh yes, a little bit of further reflection on the writings of Gustav Flaubert. His excerpt from “True Adventures With the King of Bluegrass” is poignant and worth the price of the book. One short passage intrigued me because it is extremely relatable in terms of what my own show, Deeper Roots, is all about. Tom Piazza grew up on the East Coast and, for lack of a better term, was an aficionado (if not a connoisseur) of jazz music. His sun rose and set on the be-bop and modern jazz music he was exposed to in the clubs of New York City. While eventually settling in New Orleans (experiencing Hurricane Katrina firsthand), his first real escape into middle America was to settle for a time in Iowa, attending and graduating from the famed Iowa Writer’s Workshop. Before he left, a friend (and clearly a friend to be remembered) put together a collection of vintage recordings on cassette that Tom would listen to on his drive west. The recordings were of Jimmie Rodgers, Charley Patton, Blind Boy Fuller, Clarence Ashley, and countless others, a collection of some of the most important influences and reflections of the many different cultures that are like so many microclimates spread across the American landscape. It evidently changed his view of culture and music. While attending the Workshop he would go onto describe this music’s importance to him. “I listened to those tapes the whole three years I was in Iowa. It was like having a giant ham in the refrigerator. You’d just go in and cut yourself another slice”. Could not have said it any better. 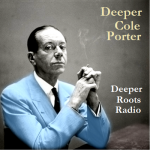 American composer Cole Porter wrote words and music for over thirty stage and film musicals. His works were typically a model of sophistication, humor, and charm that would change popular musical theater. Deeper Roots takes a look at this songwriter whose music influenced generations of the American patchwork of styles including country, rock, pop, and R&B. We’ll hear from the torch vocals of Betty Carter, playful LA country from Michael Nesmith, the cool evening jazz of Julie London, rocking R&B from Roy Brown, and the contemporary country sounds of the Texoma All-Stars. And more, of course. We’re going to take a step away from vintage releases in our first episode of 2016 and look back at last year’s Americana releases, focusing on tributes and covers from some of the very best performers of the time. We’ll hear from Happy Traum, Jorma Kaukonen, Robert Earl Keen Jr., the Alvin Brothers, Bob Dylan, Jonathan Edwards and many others as the cover music from the past century. While most are those of tradition, we’ll also hear covers of Stephen Foster, Carter Family, and Woody Guthrie for good measure. Tribute albums include Bob Dylan’s Shadows in the Night and Asleep at the Wheel’s “Still The King” Bob Wills tribute. Lots of territory to cover so I hope you’ll join in! 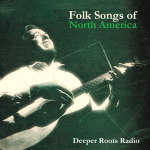 Folk Songs of North America was first published in 1960. Compiled by Alan Lomax (with melodies transcribed by Peggy Seeger), it featured traditional music organized by locale and topic. The anecdotes provided by Lomax and others were culled from both the oral and transcribed traditions of those who listened and performed. 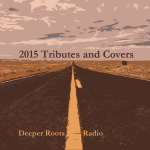 Deeper Roots goes deeper and features sets organized by topical pieces outlined in the book. Performers of the early century are featured including Dock Boggs, David McCarn, Gid Tanner, the Carolina Tar Heels, and The Bently Boys. We’ll also feature a handful of mid-to-late century performers to cap things off. Join Dave Stroud for another two hours of the last century of America’s music on Sonoma County’s newest member-supported radio voice, KWTF 88.1 FM, streaming to the world on kwtf.net.